At last, we were airborne, and we could see large patches of clear ice-free water and crushed ice down below. The plane was gradually climbing and getting on course ... No, this dull technical language won't do. The plane was headed toward victory and the North Pole! Rudolf Island soon became barely visible, and its smooth icy dome disappeared in the ice-covered sea. They asked us to sit closer to the plane's center of gravity, so as to make the pilot's work easier. We were dressed warmly in hooded fur sweaters, fur trousers, fur stockings and fur boots. But the frost was making itself felt. We had to keep our toes moving, but we were not allowed to stamp our feet inside the plane. 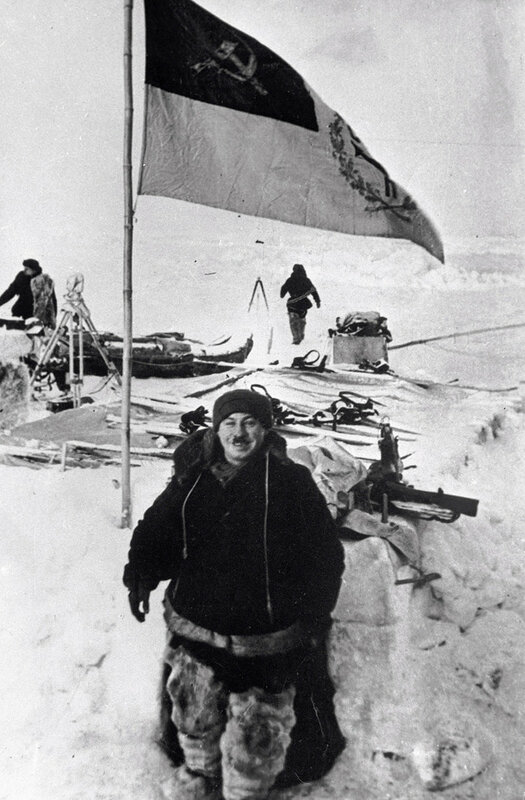 At 11:10 am, a USSR-N-170 plane commanded by Mikhail Vodopyanov flew over the North Pole. For safety's sake, we flew a bit further and descended from 1,750 to 200 meters, landing at 11:35 am. The landing strip was just about 240 paces; and the plane stopped in its tracks. Hurrah, we had reached the Pole! Everyone was beaming with delight. People were crowding near the hatch in anticipation. We wanted to hit the ice as soon as possible and see how the Pole looked. We had thought about this work for many months and had prepared painstakingly for it, taking all aspects, even mere trifles, into account. Now we were swinging into action. Mechanics were covering the engines with sheaths. We were gathering up all the essentials near the plane, including sleds, tents, kitchenware and warm clothing. Otto Schmidt and Vodopyanov were already dragging the first fully-loaded sleds, filled with various items, toward the nearest hummock ridges. Our last telegram said we had crossed the 89th Parallel; then all communications abruptly ceased after the plane's radio transceiver developed a malfunction. We hoped that the plane's much more powerful transceiver would establish communications with Rudolf Island immediately after landing, and that we would later deploy our own transceiver in due time. As the initial plan fell apart, I quickly started deploying my transceiver. Everyone understood without explanation that it was necessary to establish communications immediately. Papanin and Shirshov unfolded the masts and installed the rigging. The thermometer showed minus 15 degrees Celsius. The weather was cloudy, interspersed with occasional snowstorms. My bare hands were cold from the brisk wind. We needed to hurry, but first we had to remove all the tools and cover them. Empty pockets were filled with string. "Have you got string? Give it to me, it will come in handy too." It took us almost four hours to install the transceiver. No sooner had I started adjusting the transceiver then I heard a tell-tale low-pitched hum; the entire contraption was slowing down. I checked it with a volt-meter, which showed that the batteries were running low. It took 60 minutes to recharge them, and I was able to listen to various live broadcasts. Before taking off from Rudolf Island, we established the following communications schedule: Every hour, they would listen to our broadcasts on 600-meter wavebands, as well as on 60-meter short waves every 30 minutes. One of these waves was bound to reach Rudolf Island. The transceiver was operating without a hitch, the antenna was maintaining an electric current, and all the waves had been checked with utmost precision according to schedule. The entire tent was cluttered with equipment, with wires hanging overhead. I had to lie on my side while working and stick my legs outside because they didn't fit inside. And Rudolf Island was mumbling all the time. It goes without saying that it was unable to hear our weak 20-watt transceiver through other powerful signals. All other stations were located down south, and their operators had an even harder time hearing us. At 5 pm, I heard a message instructing all operators to stop working and listen to our broadcasts on all wavebands without interruption. Rudolf Island also switched off its transceivers: "We are listening on all wavebands ..."
At 9:30 pm, I radioed to Rudolf Island once again: "Calling Rudolf Island, calling Rudolf Island, this is the North Pole, please reply." Suddenly, I felt sure that they will now hear us and respond accordingly ... Rudolf Island replied in a jiffy. The dots and dashes of our call-sign were transmitted in a hurry; one letter was not sent properly. At such moments, even experienced transceiver operators become nervous and make mistakes. By all indications, they heard us. A smile spread over my face. I turned away, so that Schmidt would not see it because only call-signs were being transmitted properly at that point. And this was the message: "We are absolutely overjoyed ... Where are you? Please send your message." Schmidt and I shook hands. I talked to Rudolf Island, while Schmidt was writing a detailed telegram. And, of course, Nikolai Stromilov, a veteran operator, had heard us. First, he radioed back as follows: "This is Irov, can see you clearly, 88." "Can see you clearly" is our shortwave lingo, and 88 means "Love and kisses." Then I sent the most important part of the message: "Everyone is alive, the plane is okay." I learned the details of the suspense-filled hours that our comrades spent on Rudolf Island. As night fell, the day ended on a gloomy and somber note. Everyone stopped joking. Moscow was sending one query after another. The dome-shaped island became covered with dense fog, as our comrades moved to prepare planes that would take off in search of us. All of a sudden, Stromilov shrieked: "I can hear them!" People in adjacent rooms jumped from their beds and ran barefoot in the snow, without even bothering to put on any clothes. The small transceiver room was filled to capacity in no time at all, just like a Moscow streetcar during peak hours. "Krenkel, give us the weather report." "The instruments have not yet been installed, and I can only describe the weather." "We need the report now, make it snappy." "You will have to wait a bit longer. No one had any polar weather reports until 1937 AD, and you can wait 30 minutes more." A gusty wind was blowing. I was feeling cold after lying on my side for a long time near the transceiver inside the tent. My rheumatism, which began to bother me during my Arctic stints, was making itself felt. It was hard to get used to the idea that there was no warm place to myself comfortable. I could only keep warm by drinking hot tea or by wearing more warm clothes. The batteries were fully charged. Although I wanted to sleep very much, I had to broadcast the first weather forecast in the morning. Papanin and I installed the meteorological booth and fastened the instruments inside. We didn't even drink tea because we were feeling impatient and didn't want to tinker with the kerosene stove. We climbed inside the sleeping tent. Shirshov, Fyodorov and cameraman Mark Troyanovsky, our mutual friend, had been snoring inside their sleeping bags for quite a while now. There was not enough space, but inside the cramped quarters our bodies were quickly ensconced in blessed warmth. 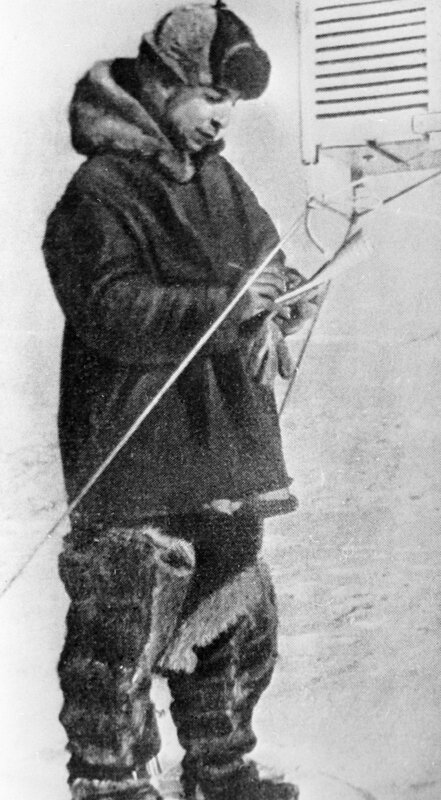 In the morning, Fyodorov wrote the first meteorological radio telegram in the log: "North Pole, May 22, 6 am Moscow Time, pressure: 761, temperature: minus 12 degrees, gusty westerly wind (Greenwich Meridian) blowing at eight meters per second. Fog, hazy sunshine, visibility one kilometer and mild snowfall"
This was the first weather report from the North Pole, and the operators on Rudolf Island had received it. They would relay our weather reports to the mainland where they would be included in the international weather report for the Northern Hemisphere. 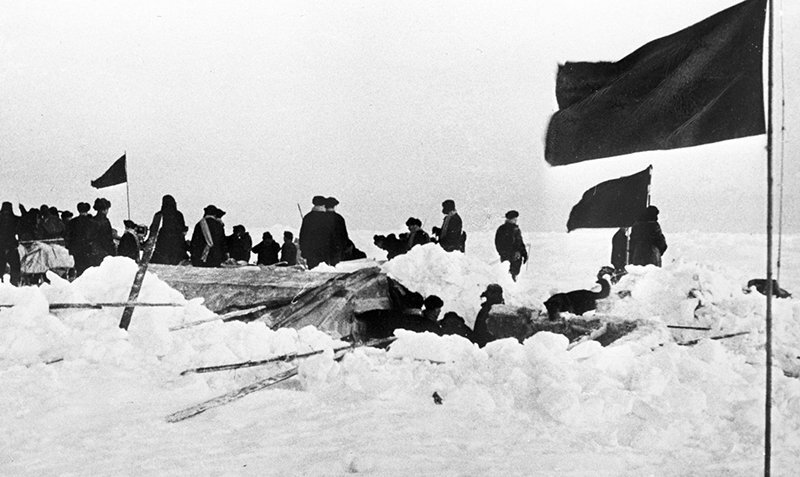 Several days later, all four planes were deployed on the ice-floe. The sun was up 24 hours a day, and this was one of the reasons for our somewhat disorganized working day. Everyone worked to the limit and then dozed for only two hours before getting back to work. We knew that the four of us would stay on, but the day when everyone else departed arrived somewhat unexpectedly and without warning. We were kissing and hugging everyone, and saying with absolute confidence: "See you"
All the planned research projects were extremely interesting. Indeed, everything we did and learned was totally unprecedented. However, we focused on sea-ice formations and the ocean's depths. Shirshov was our chief hydrologist. Of course, everyone else helped him during his difficult work but were nothing more than grunts. We had a hard time punching a hole through the three-meter thick and rock-hard ice-floe on the North Pole. We carved out a rather wide ice-hole serving as an improvised well. We went into this well time and again and shoved ice fragments inside buckets. 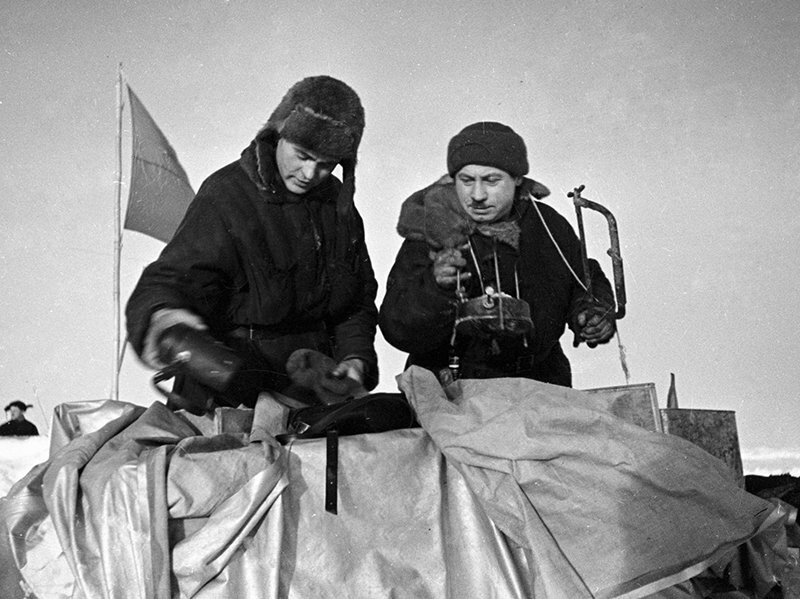 At last, a custom-made winch was installed above the ice-hole, and the long-awaited moment arrived: The four Soviet polar explorers were about to wrest another secret from Mother Nature and to learn something completely new. The sinker and the instruments had disappeared inside the mysterious ice-hole long ago, and the steel cable was receding inside the abyss like a stream of water. Mesmerized, we watched the footage counter showing the cable recede meter by meter. The instrument module had already reached a depth of over 2,000 meters. And what if the cable was not long enough? But we did not need the extra spool. The footage counter showed 4,000, 4,100, 4,200 and 4,290 meters, and then hit the bottom. After processing water samples taken from the relatively warm layer, Shirshov broke the amazing news: This layer is nothing else but an offshoot of the Gulfstream current flowing from the Atlantic all the way to the North Pole. This discovery refuted Nansen's conjecture that the central section of the Polar Basin is lifeless and resembles a desert. We had one warm insulated tent for living and sleeping. 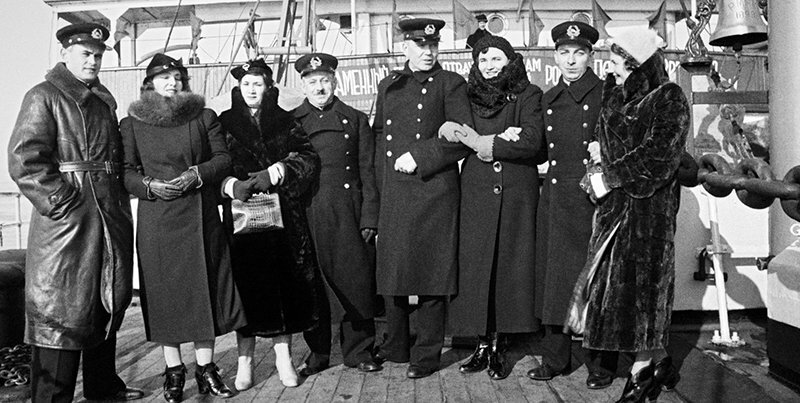 All our equipment, including our own devices, weighed not more than ten metric tons in line with the strict quotas. 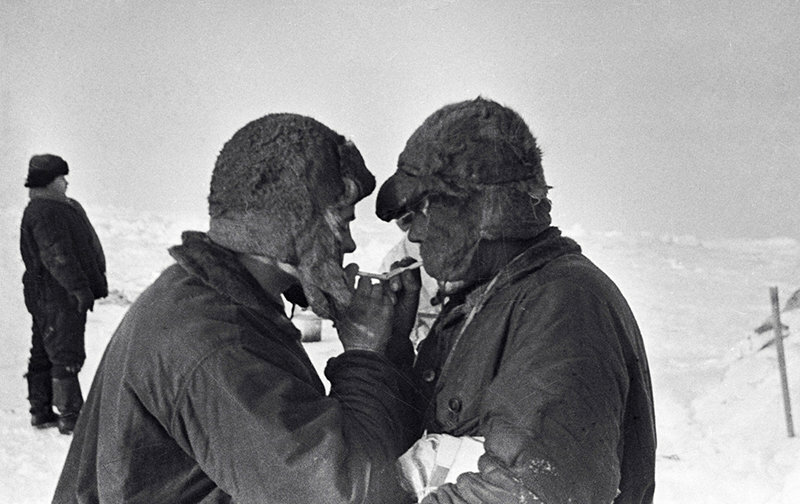 Back in Moscow, we had to fight for the right to bring an extra gram of anything with us to the Arctic. The tent's duralumin frame was covered with three layers, including a padded silk blanket filled with eider down in the middle. The two-meter tall tent was 3.7 meters long and 2.5 meters wide. There was no stove inside because one large kerosene lamp could keep this small cubicle warm. For a long time, we believed that they had issued us substandard kerosene because the lamp did not burn brightly enough. Many days later, we realized that the poor combustion and high demand for Piramidon (Aminophenazone), the ultimate headache remedy, were caused by a shortage of oxygen. The four of us were all but gasping for air at the North Pole. Summer brought new troubles, and we had to perform many extra chores. Seventy-five percent of the ice-floe was filled with fresh water, and we had to remove our equipment to higher ground, the way a cat carries her kittens. A transceiver operator rejoices when the battery is fully charged, and when he can go on air and search for amateur operators and radio hams located far away. European transceivers operate until 1 pm, while the Americas sleep. There are no broadcasts at that time, with seasoned operators alone making themselves heard. Although chances for establishing communication are pretty slim, we did maintain long-range communication in some cases. Radio hams all over the world knew all about our expedition. Many of them were politely offering their services, ready to relay some information to Moscow for us. One day, I replied to an operator with the rare call-sign K-6. We looked through our list, and we found out that he was transmitting from the Hawaiian Islands. This was really great because the Hawaiian Islands and the North Pole are worlds apart. The Hawaiian operator could hear me very well, and he praised the tone of my transceiver. I asked his surname, just to make sure. He introduced himself as Mr. Trolez from Honolulu, and he was operating a 125-watt transceiver. The weather in Honolulu was warm and cloudless, with temperatures hovering at plus 80 degrees Fahrenheit (plus 26 degrees Celsius). Radio hams were filling the air with their broadcasts, like worms crawling inside a fisherman's can. Their hoarse, whistling and high-pitched voices were calling out: "Come in, everybody, please respond." Our call-sign was very popular; all I had to do was go on air once, and responses came flooding in from all directions. Sometimes, Moscow organized concerts in line with our requests. Once, Leonid Utyosov said during his performance: "I can see your charming smile, Comrade Papanin." He was right; but, apart from Papanin, all the other unshaven and soot-covered faces were smiling from under fur hoods, as well. We were sitting quiet and silent, and we could hear the announcer say kindly at the end: "Goodbye, our dear ones." The Institute of Public Catering Engineers dealt with our food issues. They had to pay attention to various food properties, including their taste, nutritional value and weight. Our canned food did not contain any water because it was pointless to deliver water to the North Pole. The large soldered tin cans contained dry foods with a shelf life of 40 days. We had everything, including such top-quality stuff as dried bread, smoked foods, dried meat, instant soups, sugar, chocolate, pressed caviar, salt, butter, cheese and other foods. Our team did not like some of the less successful innovations, including powdered chicken meat because this powder resembled coarse river sand in color and appearance. We worked day after day without respite and made numerous discoveries. Our expedition was scheduled to last 18 months, but unpredictable drift speeds modified our plans. After the ice-floe passed the Nansen Basin, we started receiving information about efforts to prepare ships that would meet us in the Greenland Sea. We experienced a powerful jolt in the evening of January 31, 1938. We grabbed our electric flashlights and started inspecting the ice-floe, bending low due to the powerful winds. We spotted numerous cracks around our tent. Papanin waded knee-deep in water, tossed out various items from the depot, and we dragged them aside. The stars peaked out from behind tattered patches of clouds. It took us six days to find our bearings. Our observations produced unexpected results: it turned out that our ice-floe had drifted by 220 kilometers during this period. Every hour, the situation grew worse, with additional cracks forming all the time. A crack also appeared under the sleeping tent, and water started flooding in. We had to abandon the time-tested and cozy tent, and our days of measured work were over. By the morning of February 2, our ice-floe had shrunk to a fragment measuring 30 by 50 meters. At this point, we had to save our property scattered on other ice-floes. Two of us took turns gathering it up. We dug a large hole, lined it with snow-brick walls and covered everything with the remaining tarpaulin. We spent the last two weeks inside this improvised den. To determine the seabed's relief, we conducted 33 ocean-depth soundings, with 14 soundings showing a depth of over three kilometers. We installed 38 hydrological and 22 marine-biology stations. We also measured currents on 600 occasions using current meters. We determined the force of gravity at 22 locations. Additionally, we conducted five series of measurements to determine declination levels and the horizontal aspect of the terrestrial-magnetism force, as well as 36 measurements of the magnetic-inclination force. Moreover, we conducted 14 daily series of the terrestrial magnetic field's fluctuations. We observed atmospheric electricity flows and conducted hourly Aurora Polaris observations at night. All observations had to be meticulously pegged to various locations. For this purpose, we "shot" the sun 534 times using sextants and measured 374 azimuths. Moreover, we conducted meteorological observations under a normal program of polar stations and transmitted weather reports every two hours for air crews performing trans-Arctic flights. The icebreakers Taimyr and Murman sailed toward us from Murmansk, followed by the Yermak from Kronstadt. I was on duty February 12, and I noticed a light glimmering in the east at 6:45 am. First, I decided not to jump to any conclusions because, on some occasions, we disoriented and mistook a rising star for a remote light. This time, however, the light vanished for a while and reappeared, shining bright. I watched it for about two hours. The light did not rise above the horizon, proving that this was not a star. I lit a gasoline torch and waved it. The light started blinking in return. Obviously, this was a searchlight aboard the Taimyr. I woke up my comrades, and we took its bearing. We agreed during our radio communications that the ship's crew would switch on its searchlight at 10 pm, and that we would shine a magnesium torch in response. We lit the blinding torch and immediately received a message from the ship's transceiver that they could see us clearly. At that point, we had no doubt that the distance between us was not more than 50 kilometers. The searchlights of two ships became clearly visible on February 18. At 2 pm, two groups of sailors got off from the ships. At first, the sailors walked along but couldn't hold back and ran toward us, resembling an attacking force. They showered us with news and questions. We felt and looked happy. Dozens of people volunteered to help us wherever we went. And dozens of hands quickly accomplished what the four of us had trouble doing. We spent just nine months on this ice-floe, but we experienced enough to last us a lifetime. Temperatures were dropping; I was looking for my mittens and couldn't remember where I had put them. Anyway, I didn't need them anymore ... Farewell, ice-floe!